Bring a packable tent or shelter. In recent years, pop up shelters and easily opened tents have been increasing in number on beaches across the country, and for good reason. These shelters protect your family from the sun’s harmful rays, and can be a great way to stay cool on the sand. Think like a sherpa. When you’re trekking from the car to the beach with children in tow, think ahead about how you’ll carry everything you’ve packed for the day. Rolling carts are a great idea, as they can carry a heavy load and allow you to hoist your 3 year-old who has decided that she doesn’t want to walk. Bring disposable, zippered pouches. Ziploc bags are your friend when you’re planning a beach day with young children. Whether you need to dispose of a dirty diaper or keep wet clothes separate from dry ones, you’ll be glad you brought a few of these handy items. Get there early in the day. 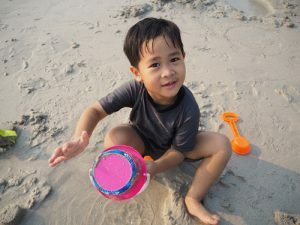 Since your children are getting you out of the bed at dawn anyway, why not pack up the car and head to the beach by 9am? You’ll beat the crowds, find better parking, and will have a serene spot on the beach and plenty of splashing space in the water. Plus, you’ll avoid the extreme midday heat. Camp out by the lifeguard station. Not only will you reap water safety benefits by being right in the line of sight of the lifeguard, but you’ll also have a landmark that your kids will easily be able to see as they navigate their way back to your beach blanket. Don’t skimp on the sunblock. Many pediatricians recommend physical sunblocks that contain Titanium Oxide and/or Zinc Oxide these days. These sunblocks offer protection as soon as they’re applied, protect skin from both UVA and UVB rays, and are more environmentally friendly. Be sure to reapply an SPF of at least 30 every two hours, or whenever your kids get out of the water. Free up cooler space by freezing food. Bulky ice packs can take up a lot of room in your cooler. Freeze water bottles, grapes, and yogurt sticks, and they’ll keep the rest of your food cool. and continue the countdown until it’s time to go. Advance notice helps to alleviate the grumpiness that accompanies leaving the sun and sand. Have dust broom and pan, will travel. Before your kids get in the car, brush them down with a soft dust broom, and have a go at the bags and toys you’re packing, too! Let it go. There will be sand, water, ice cream stains, tears, laughter, messy hair, and lost toys. Remember that with a little beach fun comes a little beach chaos, and give in. 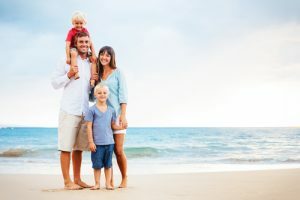 What are your family’s tried and true beach tips? Give us a shout in the comments section!